First, let’s start with setting up your development environment. You will need a Firefox browser and basically whatever code editor you prefer (Sublime is the best). Then, there are some recommended things to do to prepare Firefox. The first step is to create a different profile in Firefox, since you will do some settings and changes that you probably don’t want for your regular profile. In my case, I’ve created a new development profile named dev. Open the Windows Start menu and choose the Run option (on Vista, it might not be there – just press Windows key + R in that case). In the run dialog, write firefox -P and press enter/click OK. Choose Create Profile in the dialog and follow the steps. Open the Terminal (located under /Applications/Utilities) and type in /Applications/Firefox.app/Contents/MacOS/firefox -profilemanager. Open a terminal, use CD to navigate to your Firefox directory and then enter ./firefox - profilemanager. Choose Create Profile in the dialog and follow the steps. Open Firefox through the Profile Manager (process described above, or set the development profile as default during extension development). Then enter about:config in the address bar. It will warn you about changing settings, but it’s ok since what you will do is only minor changes for development. You can filter the existing settings, and if any of the below settings don’t exist, you can just create them. Point your Firefox extensions directory to your extension. Instead of constantly preparing and reinstalling your extension, there’s a simple way to add a pointer from your Firefox extensions directory to your code location. Open the Terminal and type in CD ~/Library/Application\ Support/Firefox/profiles/. There you will find your Firefox profiles, and they will be named with letters and numbers, followed by a dot (.) and then your profile name, e.g. 12a3bc4d.dev. Open a terminal and type in CD ~/.mozilla/. In that location, you will find all your Firefox profiles, and they will be named with letters and numbers, followed by a dot (.) and then your profile name, e.g. 12a3bc4d.dev. In your development profile folder, you will find a folder named extensions. In it, you will have code for all your installed extensions. Instead of placing your code there, you can create a pointer file. Do that by creating a file with a unique name for you (this will have to be the same as you chose for your em:id value in your install.rdf file – more on that below). What is needed to have a good base for your extension development, is to create the structure of the extension code. The most interesting key here is content_scripts, which tells Firefox to load a script into Web pages whose URL matches a specific pattern. In this case, we're asking Firefox to load a script called "borderify.js" into all HTTP or HTTPS pages served from "mozilla.org" or any of its subdomains. 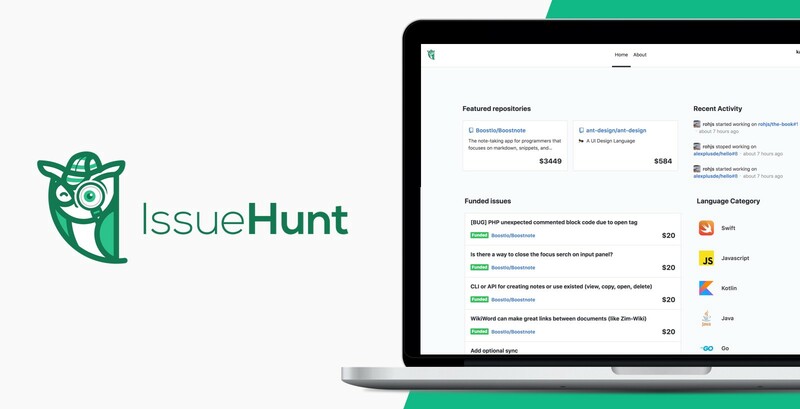 BoostIO launches a funding/sourcing platform for open-source projects called IssueHunt for sustainable OSS ecosystem. Anyone can fund any issues on GitHub and these money will be distributed to maintainers and contributors.